Durvet’s Apple Scented and Flavored Lip Balm will have your mouth watering. This lip balm is naturally formulated with Aloe Vera and natural extracts used to moisturize and help keep lips happy and healthy. 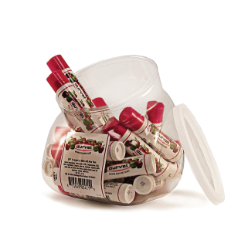 With a SPF 15 rating, Apple Lip Balm also offers protection against the Sun’s dangerous UV radiation. Octinoxate 7.5% Oxybenzone 3.0% Other Ingredients: Organic Palm Oil, Beeswax, Organic Extra Virgin Olive Oil, Flavor, Aloe Vera, Organic Hemp Seed Oil, Rosemary Extract, and Vitamin E.